What is it about winter that makes our skin and hair turn into something we can’t recognize? Between the dry, cold weather and the busyness of the holiday season…add in a few days of beings snowed in, my beauty routine was in need of some serious help. I received theTinsel VoxBox from Influenster earlier this winter and could not have been more excited to find the great beauty products waiting for me to try. I’m going to break down my favorite products from this box for you and hope that if your beauty routine is experiencing the same winter blues as I was, these products might help! The Eva NYC Freshen Up Dry Shampoo and her pretty sister Eva NYC Forget Me Knot Dry Conditioner have been my BFF’s this winter, and I see this being a long lasting friendship. I have been a dry shampoo advocate for quite some time and I thought I had my routine down with my favorite products. Boy, was I wrong! Eva NYC Freshen Up Dry Shampoo and Eva NYC Forget Me Knot Dry Conditioner not only smell like a dream, but I loved the way my hair felt. I was able to go an extra day (sometimes two) without washing and my hair never got that greasy, cakey feel I used to get with other dry shampoos. I’ll admit, I was skeptical of the Eva NYC Forget Me Knot Dry Conditioner and unsure how I could put this product to use. Spray a little bit of the Forget Me Knot Dry Conditioner into damp or dry hair and your style will stay fresher longer. Between washes, the dry conditioner kept my locks smooth and tame. After the holidays my skin was in rough shape. Too many late nights and a little too much over indulgence on the spirits and the snacks if ya know what I mean. I will admit, this mask is not the prettiest, or the best smelling, and it can hurt a little if you do not peel off gently. Now, having put all of that out there, my skin did feel brighter, smoother, and some of my blemishes seemed to clear up after using this charcoal facial peel mask. You get a lot in one of the tubes, so I split the tube into two different applications and applied only on my nose (t-zone), and chin. 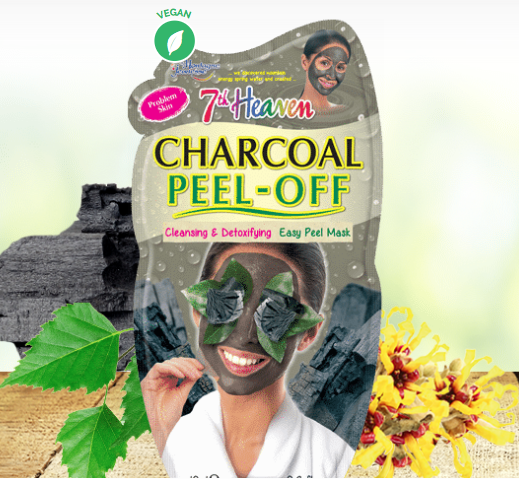 If you’re looking for a quick way to unwind and detoxify I recommend the 7th Heaven Charcoal Facial Peel Mask. Winter dry skin sufferers rejoice! If there’s one product that has quite literally saved my skin this winter, it’s this magic renewal cream oil from Gold Bond . Before you roll your eyes and click away at the mention of Gold Bond, hear me out. Like many, my skin gets super dry and chapped (hot, I know) in the winter. Coconut oil, exfoliating, lotions, creams, you name it and I lather it on. I was loved the calming effect this renewal cream oil had on my skin. A little bit of Radiance Renewal Cream Oil goes a long way, which is something I appreciate when it comes to skincare. I didn’t the greasy feeling like I do from using coconut oil, and there was no overbearing scent like I experience with some body lotions. If you’re looking to add some moisture back into your skin, please check out this Gold Bond lotion! This lip crayon from Lucious Cosmetics is not only easy to use, but it has amazing pigment and wear. I am not normally a red lip kinda gal, but after trying this little beauty out I may have been converted. Red lipstick usually intimidates me. I’m worried I’ll miss my mouth or end up looking like a clown. I loved that the Luscious Cosmetics Pout Maker was an easy to maneuver crayon. This lip color w as easy to apply and stayed on well throughout the day. Talk about PIGMENT. You do not need multiple coats with this Lip Crayon because the color is so rich. Not feeling the red? Don’t worry, Lucious Cosmetics has 14 different shades of Pout Maker Contouring Lip Crayons, so you’re sure to find shade that suits you. Looking for some winter beauty superheroes or a way to freshen up your look while we inch our way to spring? I’ve linked all of these amazing products below! *I received these products complimentary from Influenster for testing purposes. All opinions are my own. Great tips, will make sure to try out some of these, my hair has been a mess lately and have no idea what use ! Thank you!